The ViewSonic LightStream™ PJD5553LWS is designed with elegant style and audiovisual performance. A short throw lens with a 0.49 throw ratio offers large projection images for smaller rooms. This white projector makes a big statement with its elegant curves and light beam shape. Its thoughtful design, which includes a tactile keypad, instructional icons, and non-slip foot pads, also presents an intuitive and user-friendly interface. With SuperColor™ 6-Segment Color Wheel maximizes color saturation and brightness for true-to-life image projection. The LightStream Projector PJD5553LWS is also powered by SonicExpert™ technology; the built-in speaker surpasses competing products in sound clarity and volume performance, as well as comfort. 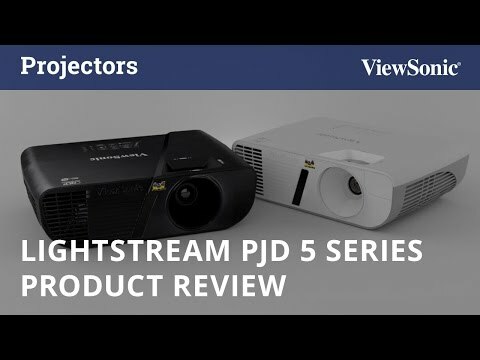 The LightStream Projector PJD5553LWS boasts HDMI connectivity and native WXGA resolution. It provides digital high definition devices, supporting media-rich business and education presentations. The HDMI delivers single-cable transmission of image and sound signals, for a more convenient installation process. The 3,200-lumen lamp with a 22,000:1 contrast ratio is for clearer and brighter images. From small to medium meeting rooms or classrooms, LightStream Projector PJD5553LWS delivers quality images in brightness and colors. Supporting 2 x VGA, Composite Video, S-Video, 1 x VGA output, Audio in/out, Mini USB and RS232, this projector has flexible connectivity with analog-based equipment, providing compatibility with conventional analog-based applications without adapters or converters. DynamicEco® further reduces power consumption by up to 70% and extends the lamp life by up to 10,000 hours. Equipped with the latest HDMI, this projector can display 3D images directly from 3D Blu-ray players—perfect for connecting to any HDMI-enabled devices such as PCs, laptops, tablets, and media players. With embedded rich I/O ports, this projector has flexible compatibility with high-definition digital video and audio, as well as conventional analog-based applications and industrial applications, such as RS-232, without adapters or converters. A variety of applications include PC, notebooks, gaming consoles, conventional analog-signal players, set top boxes, IPCs, etc.